In Hawaii there are several groups adamantly opposed to the presence of biotech seed companies which have farms on Kauai, Oahu, Maui and Molokai, where the main activity is the integration of the latest corn traits from research into production varieties and increase of elite parent lines through traditional hybridization and selfing. With the increasingly widespread adoption of biotech crops in many countries and the scientific consensus on their safety, these opponents of modern agriculture have turned to pesticide use on the corn seed farms as the focus of their campaigns which often promote misinformation on this subject. They also seem to ignore the reality that all agriculture (including organic) uses pesticides. And that they are becoming quite safe. 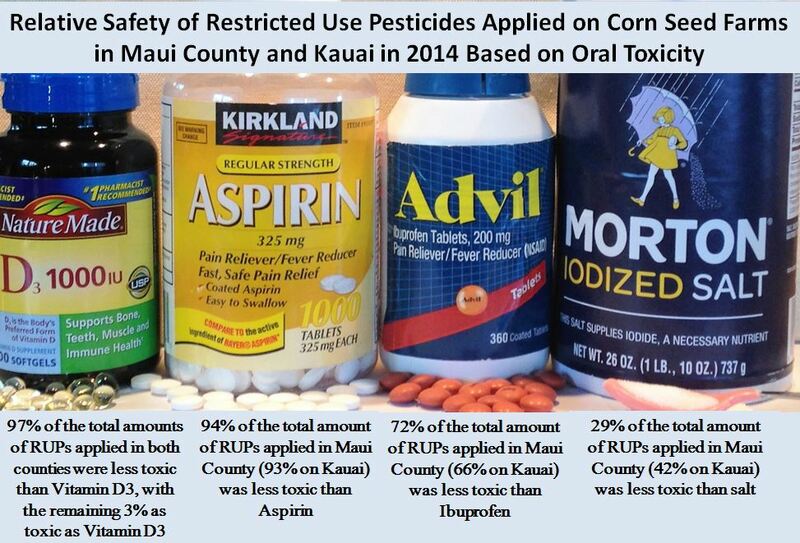 Meanwhile, data on the restricted use pesticide (RUP) products, amounts and area treated by the seed farms* on Kauai are being recorded monthly on the Kauai Agricultural Good Neighbor Program site, and similar data is being reported annually by Monsanto for Maui County operations, for all to see. When combined with easily accessed public information (see references) on the toxicity characteristics of these pesticides, we can evaluate their relative safety and overall risk that they present to us. Acute oral toxicity of a substance is determined through testing on rats (or other animals) as a proxy for potential effects on humans. A measurement of the lethal dose for half of the test population is expressed as the LD50 value in terms of milligrams of the substance per kilogram of body weight of the animal. For instance, the LD50 of aspirin is 200, the LD50 of table salt is 3000, and the LD50 of the herbicide atrazine is greater than 5000. The larger the LD50 value of a substance (a vitamin, medicine or a pesticide), the less toxic it is. Thus, aspirin’s active ingredient acetylsalicylic acid is 25 times more toxic than atrazine. The commonly consumed products in the image above are shown in decreasing order of oral toxicity from left to right, based on their LD50 values. Vitamin D3 is the most toxic (and has been used as a rat poison), and table salt is the least toxic. For both the common supplements and medicines we routinely consume and for pesticides, the dosage that we are exposed to is very small, and therefore risks of toxic effects are also very small. Comparisons of toxicity of pesticides with familiar compounds we consume illustrate how safe pesticides have become. Analyses of the LD50 values of the RUPs used on the corn seed farms show that 97% of the total amount used in 2014 was less toxic than vitamin D3, with 3% as toxic, and no pesticide was used that was more toxic (see summaries in image above). Large portions of the RUPs applied were less toxic than aspirin and ibuprofen, and between 29-42% were even less toxic than table salt. This is not quite the ‘poisoning of paradise’ scenario being sold to us by opponents of agricultural biotechnology. Steve Savage notes that while consumers may worry about the potential toxicity of the pesticide residues on foods they consume, evidence shows the pesticides in use today have very low acute toxicity. As well, our exposure to them is quite low, as summarized in the large database on this subject from USDA’s Pesticide Data Program. A calculator derived from this data collected nationwide shows the enormous number of servings of common fruits and vegetables a person could consume in one day without any effect even with the highest pesticide residue recorded by USDA for that crop. The potential for adverse effects of RUPs is mitigated through (as their name implies) restrictions. The most common restrictions for RUPs applied on corn seed farms in Hawaii are for protection of fish and aquatic organisms. Accordingly, these RUPs cannot be applied directly to water, to areas where surface water is present, or to inter-tidal areas below the mean high water mark. There are also restrictions on their application rate, frequency and number of applications per season, and total amount that can be applied in one season. When the EPA determines that these pesticides can be registered for use, it has concluded that their use will not cause unreasonable adverse effects to humans or the environment when applied according to the label directions and restrictions. We all want to enjoy safe food and a safe environment to live in. There are many indications that agriculture has never been safer than it is today, including the pesticides that are necessary for our food production. The scientific evidence on this is available for those who want to be informed. The evidence tells a compelling and encouraging story of progress in science and agriculture. *The database also includes RUPs used by Kauai Coffee Company. Sources of toxicity information from Safety Data Sheets: CDMS, ScienceLab.com, TOXNET, Iowa State University and Fisher Scientific. Ames BN, Profet M and Gold LS. 1990. Dietary pesticides (99.99% all natural). Proc. Nad. Acad. Sci. USA Vol.87, pp.7777-7781, October 1990. Hawaii’s Pesticide Laws and Regulations. Charles Nagamine. 2012. Pesticide Risk Reduction Education Program, College of Tropical Agriculture and Human Resources, University of Hawaii at Manoa. Katiraee L. 2015. Myth busting: Are synthetic pesticides, used with some GMOs, more dangerous than natural ones? Genetic Literacy Project. Label Review Manual, Chapter 7: Precautionary Statements. 2014. Pesticide Registration, US Environmental Protection Agency. Search Hawaii State Pesticide Products. National Pesticide Information Retrieval System. Unfounded pesticide concerns adversely affect the health of low-income populations. 2011. Summary of presentation by Bruce Ames to the 242nd National Meeting & Exposition of the American Chemical Society. ← Comment is Free but Facts are Sacred. Not This Time. Your main point is well taken. The relative toxicities of salt and of several RUPs are quite low because the dosage and exposures are normally quite low, and I use the comparisons to highlight how safe many pesticides have become over the years.